We’ve been adding new furniture for every room in your home at American Freight! When it comes to cheap deals on living room furniture, we have all styles, colors, and prices to spruce up your space for Spring. Our recent lounge-worthy additions include rockin recliners, sofas and loveseats, and a variety of new sectionals all right here on our new products page. Today we’ll give clues for a comfy new brown sectional, which is one of our favorite fresh additions. See if you can guess this surprise piece based on the clues below! Comment below if you solve the word scramble of the product description. 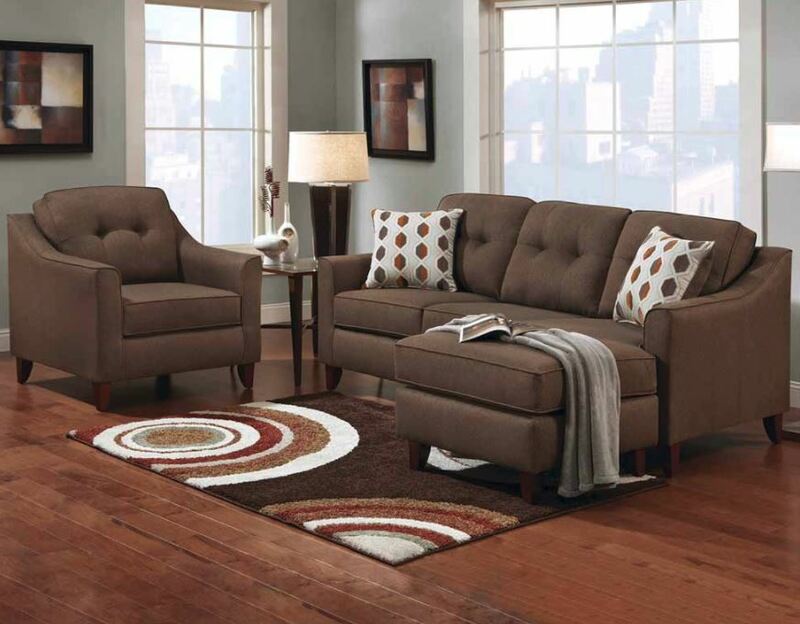 This 2 piece sectional sofa is a rich chocolate color with a reversible chaise. The two pieces include the three-cushion sofa, as well as a reversible chaise section that can attach to the front of the right end or the left end. This living room set can be either RAF (Right Arm Facing) or LAF (Left Arm Facing). It’s a classic shape and size, and its neutral brown shade gives it a timeless appeal. The curved arms give it some character, as it’s not your basic out-of-the-box sectional you see in everyone else’s home. This one has some flair! And it’s super affordable. Take it home today for just $498! Click here to go to the product page. Why Would You Want a Reversible Chaise? They say you should never have to chase true friends or true love. But, we think a reversible chaise is worth chasing! With a reversible chaise lounge, you can set your sectional up as RAF (Right Arm Facing) or LAF (Left Arm Facing). These identifiers refer to the location of the arm when you are facing the piece. So, when you’re looking dead ahead at the sectional, if the chaise is on the right, it is an RAF sectional. If you’re looking straight ahead at it, and the chaise is on the left, that is an LAF sectional. The beauty of the reversible chaise on this Tuesday Teaser surprise sectional is that it is able to move to either end, depending on your living room setup. No matter which way you want the ottoman to face, you are able to unlatch it and reconnect it on either end! That’s what we call versatility. Thinking about selling your home? Click for home staging tips.